To Aun on the "Ships starting with A" page. Tonnage: 1908 gt, 3175 tdwt, 1137 net. Built by Smith's Dock Co. Ltd., Middlesbrough, England in 1930 (Yard Number 916?). Dimensions 270.6'-43'-18.6'. Triple expansion 3 cylinder by Smith's Dock. Cylinders 19" 31" 52" x 36" stroke. Apr. 25 Southend   OA 136 See also Page 1. * This voyage is also out of place. Departure date should be March 8; the voyage belongs further down, and has been inserted there. (but again, see Page 2). Dec. 24 Philadelphia New York City Dec. 26 Independent Arrived Newark, N.J.
Febr. 18 Milford Haven St. John's, N.F. March 5 ON 68 For St. John's, N.F. March 18 Halifax St. John, N.B. March 19 XB 1 For St. John, N.B. May 24 Boston St. John, N.B. May 26 BX 20 To St John, N.B. June 19 Sydney, C.B. Wabana June 22 SC 88 See also narrative below. Aug. 8 Liverpool Halifax Aug. 27 ON 120 For Sydney, C.B. Sept. 9 Halifax St. John, N.B. * Sept. 11 Independent *Arrived Chatham, N.B. Oct. 24 Oban Halifax Nov. 7 ON 141 For Halifax. Dec. 14 Sydney, C.B. Halifax Dec. 17 SH 69 For repairs. Dec. 25 Halifax St. John, N.B. * Dec. 27 HF 24 For docking at Boston, arr. Dec. 27. *Convoy HF 24 did arrive St. John, N.B. on Dec. 27, but Aun arrived Boston that day - See Page 3. Oct. 7 St. John's, N.F. Sydney, C.B. Oct. 10 WB 61 Ex St. John's N.F. Possibly ON 204, dep. date estimated. *Convoy XB 78 did arrive Boston on Oct. 16 (having started out in Halifax), but Aun arrived New York City that day - See Page 4. July 31 Townsville Sydney, N.S.W.  Independent Page 5 gives arrival Sydney Aug. 7. *Page 5 gives departure Brisbane Dec. 17, arrival Sydney Dec. 20. Aug. 22 Liverpool Clyde Aug. 23 Independent (Also, Page 5). Nov. 1 Tyne Reykjavik Nov. 8* Independent *Page 6 gives arrival Nov. 6. Aun is listed in the Halifax-U.K. Convoy HX 24 in March-1940. She had a cargo of grain, and the original convoy document gives her destination as Rotterdam - according to A. Hague, she arrived Falmouth on March 16, having become a straggler on March 3. The following month she's listed, together with the Norwegian Octavian, in Convoy OA 136, which departed Southend on Apr. 25 and dispersed 2 days later - ref. external link provided in the above table. Her destination is given as St. John, N.B., but she arrived New York on May 12, proceeding to Baltimore on the 14th; see Page 1 (it'll be noticed that she spent quite a long time in Mobile that fall). Her 1941 voyages also start on this document and continue on Page 2, which shows a long stay in New York City (it looks like she made 2 voyages to Greenland that year). 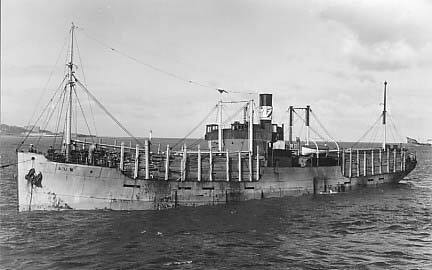 Skipping now to Jan. 17-1942 when we find her, with a cargo of timber for Southampton, in the slow Halifax-U.K. Convoy SC 65, having cancelled from the previous convoy, SC 64. She returned across the ocean the following month with the westbound North Atlantic Convoy ON 68*, which left Liverpool on Febr. 19 and dispersed on March 9; Aun had arrived St. John's, N.F. on March 5, having sailed from Milford Haven Febr. 18 (Page 2). Other Norwegian ships in this convoy were Carrier, Danio, Evanger (Commodore Vessel), Ingertre, Rio Verde and Tyr (sunk - follow link for details). At the end of March she joined Convoy SC 77 in order to head back to the U.K. Aun had station 102, cargo of flour for Bristol, where she arrived Apr. 19. She's now listed, together with Bjørkhaug, Borgholm, Heimgar, Lido, Lisbeth (returned), Nea, Norjerv, Norvarg, Rio Verde, Selbo, Snar, Suderøy, Velox and Ørnefjell, in the westbound Convoy ON 90* - her voyages in this period are shown on Page 3 (convoy originated in Liverpool Apr. 28, arrived Halifax May 15). Some of these ships headed back to the U.K. with the slow Convoy SC 87 from Sydney, C.B. on June 12, and Aun was also scheduled, but instead joined the next convoy on June 19, SC 88, having previously arrived Sydney C.B. on June 14 with Convoy HS 12 from Halifax (June 12). Acanthus, Montbretia, Potentilla and Rose are named among the escorts for SC 88 (see SC convoy escorts). Aun, however, had to put into St. John's, N.F. with boiler trouble, and later joined Convoy SC 89 from there. Her destination is given as Garston, cargo of lumber, and she arrived there on July 12, later spending over 3 weeks in Liverpool. In Aug.-1942 she's listed in the westbound Convoy ON 120*, which left Liverpool on Aug. 8 and dispersed on the 27th, Aun arriving Halifax that same day. The Norwegian Borgfred, Fjordheim, Måkefjell, Solitaire and Suderøy are also listed. About a month later, A. Hague has her returning to the U.K. with Convoy SC 102*, which originated in New York on Sept. 19, but Aun joined this convoy from Sydney, C.B. a few days later, cargo of lumber, station 11. Page 3 gives her destination as Hartlepool, and she arrived there on Oct. 9. Aragon, Bestik, Borgfred, Fjordheim, Nea, Norvarg, Orwell, Solitaire and Solsten are also named (though Nea and Solitaire returned to port). Aun subsequently headed back across the Atlantic with Convoy ON 141*, which originated in Liverpool on Oct. 24 and arrived New York on Nov. 10, but Aun was bound for Halifax on that occasion, arriving there on Nov. 7, having started out from Oban Oct. 24. She had again been in the company of several other Norwegian ships, namely Albert L. Ellsworth, Anna Odland, Fagerfjell, Fernmoor, Fernwood, Gallia, Herbrand, Jenny (returned), Pan Aruba, Reinholt, Salamis, Samuel Bakke (Commodore Vessel), Skiensfjord, Trondheim and Ørnefjell. According to Arnold Hague, she ran aground on arrival destination when in Convoy SB 36 from Sydney, C.B. to Port au Port, which left on Nov. 20-1942 and arrived 2 days later. She needed some repairs afterwards; from Port au Port, she proceeded to Humbermouth on Nov. 30 for discharge and repairs, leaving again for Sydney, C.B. on Dec. 13. She's now listed in Convoy SH 69 (from Sydney, C.B. Dec. 14, to Halifax Dec. 17), and later that month she continued to Boston, where she arrived on Dec. 27 for docking and repairs, having joined Convoy HF 24 for this voyage (departed Halifax Dec. 25) - again, see the external links provided within the voyage Record. She did not leave Boston again until March 8-1943, when she made an independent voyage to New York, and on March 14 she joined Convoy NG 349 from there, arriving Guantanamo on the 21st (the Norwegian Baalbeck and Brønnøy are also included). She subsequently joined the Guantanamo-Trinidad Convoy GAT 51, which left on March 21 and arrived on the 27th (see also Page 3). In May that same year we find her, together with Askeladden and Litiopa, in Convoy TAG 59, departing Trinidad on May 9, arriving Guantanamo on the 14th, then joined Convoy GN 59 that same day, arriving New York on May 22. The Norwegian Heimgar and Litiopa are also listed in this convoy, ref. links in the table above. Aun's voyages in this period can be found on Page 4. That summer she's listed, together with the Norwegian Annik, Lutz, Nyco, Sevilla and Ørnefjell, in the Halifax to St. John's Convoy HJ 60, leaving Halifax on July 7-1943, arriving St. John's on the 10th, then made a voyage to Greenland. For this voyage, A. Hague has included her in Convoy SG 28 - departure St. John's, N.F. July 15, arrival Greenland July 19. (Annik, Carmelfjell, Gudvor, Havmøy, Iris, Lutz, Nyco and Ørnefjell are also included in this convoy). She's later listed as 1 of 2 ships in Convoy GS 31 from Greenland to St. John's, N.F. (departure Sept. 30, arrival Oct. 5). She subsequently travelled to Sydney, C.B. in Convoy WB 61, originating in Wabana on Oct. 7, arriving Sydney, C.B. on the 10th, then proceeded to New York, where she remained for a long time (Page 4). At the end of that year, in Dec.-1943, she shows up (with the Norwegian Bernhard and Drafn) in Convoy NG 404, from New York Dec. 13, to Guantanamo Dec. 20, and is then listed, along with Lillemor, in Convoy GZ 54, departing Guantanamo on Dec. 25, arriving Cristobal on the 29th. In the spring of 1944 she appears in Convoy BG 58 from Buna to Langemak Bay (departure March 14, arrival next day), and is said to have joined Convoy GB 63A a week later (departure Langemak Bay March 22, arrival Milne Bay March 24). The rest of her 1944 voyages are noted in the table above, as well as on Page 4 and Page 5, the latter document also showing some of her 1945 voyages. According to "Våre falne", a series of 4 books naming Norwegiana who died during the war, Able Seaman Bernt Martin Egeland signed on Aun on Dec. 4-1944. Around midnight the next day he was found dead. The assumption was that he had been beaten to death by an Australian. He's buried in Brisbane, and here's a picture of his gravestone (external link). According to Page 5 above, Aun had arrived Brisbane from Langemak Bay, but arrival date is not given. In Apr.-1945, she's listed in Convoy MKS 96* and arrived Falmouth on Apr. 27 (convoy left Gibraltar Apr. 20, arrived Liverpool Apr. 28). Again, please see Page 5 and the Voyage Record above for further voyages. Page 6 has her voyages to March-1946. * The ON convoys will be added to individual pages in my Convoys section in due course, with more information on each; in the meantime, the ships sailing in them (and escorts) are named in the section listing ships in all ON convoys. The entire SC series will also be updated and completed (including the already existing convoys - some have already been updated), but for now, see ships in all SC convoys. Aditionally, the MKS convoys will be added, see the section for ships in all MKS convoys. Renamed Liana in 1948, Rederi A/B Lerberget (Jan-Erik Fange), Helsingborg. Renamed Marguerita in 1963. Compare with the information found on this external page, which also says she was sold for breaking up in Sept.-1970. Back to Aun on the "Ships starting with A" page. A more recent Aun: The company also had a ship named Aun (tanker/chemicals) in 1981, delivered in Dec. that year, 1425 gt. Renamed Solstraum in 1985 (Anders Utkilens Rederi, Bergen). Became Sun Trader (Haugesund owned) in 1990, 2092 gt.